Is your upper microphone is not correctly picking up sound for recording? Perhaps no-one can hear you on Skype or voice recognition is not optimal? 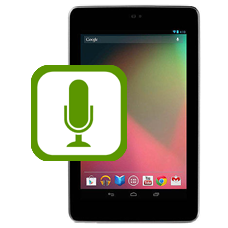 If so we can replace the top microphone with a brand new one, restoring your sound recording capabilities on your Nexus 7. The lower microphone is located on the logic board. If you need to replace this part, you may have to buy a new logic board and fit that.